In June 2015, we estimated size of global language services market in 2016 at US $40.8 billion. 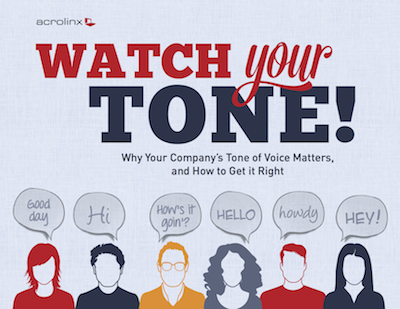 This ebook by Ann Handley* is distributed via the Acrolinx site. Register for free download here. * Ann Handley, Chief Content Officer at MarketProfs and author of EVERYBODY WRITES, Your Go-To Guide to Creating Ridiculously Good Content. Quote: I believe that good writing is something anyone can produce. Comment (SD): Either this is very wishful thinking or we live in different worlds. Good writing is rare precisely because most people can't do it. See, for instance, Skapinker on Pinker on style. Yes training can help, but only when the trainee has a modicum of raw language talent. Quote: In B2B, tone of voice is a story that’s just beginning. Most companies haven’t woken up to the idea at all. A few have taken great strides. But almost none have successfully transformed the way they use language — and that opens up a huge opportunity. Quote: Your customers see all your communications as parts of a whole, so you should too. Comment (SD): Serious over-simplification. Different types of readers seek different types of documentation and have different expectations. Anyway, who can afford to have their best writers working for months on end on 'for information' documents for engineers and technicians. Quote: Good jargon signals that you’re part of a community, and saves time too. Comment (SD): Agree entirely. I have blogged on precisely this several times. Most online advice on writing concerns general journalism for lay readers resulting in ill-thought-out guidelines making it more difficult to develop and apply a consistent tone or voice. Quote: The prescriptive view is that we should respect and obey the rules of grammar whether we agree with them or not. The descriptive view is that the right way to use language is the way people actually use it in speech and writing, not as reflected in rules created by academics. Comment (SD): Agree entirely. See The one grammar rule that really counts. Quote: For example, English and other Northern European languages put a strong emphasis on logical structure. In French or Spanish, however, this style can sound dull, because digressions are seen as a sign of intellect rather than disorganization. In Asian languages, because of concerns about losing face, people talk around the subject to present all sides of the issue without explicitly stating their conclusion*. * The Little Book of Transcreation, p. 14. Free download from transcreation agency Mother Tongue. Comment (SD): Now you're dealing with issues that rightly suggest that translation and transcreation often call for a different voice in a target language from that adopted in the source language, which, in turn, calls for additional skills and significantly bigger budgets. Quote: Since tone of voice is flexible, some documents may need more localization than others. High-profile marketing and advertising, which is much more likely to use tactics such as puns or cultural allusions, almost certainly needs localization. But even purely informational content, such as technical documentation, may suffer if translated literally, because motivations and attitudes differ so much across cultures. For example, while US training tends to be interactive and hands-on, French people tend to prefer more information, less participation**. Comment (SD): Same as above.